7.97 points at 33 votes (rank 87). Nobody knows his real name and nobody knows, where he comes from. But one thing is sure, he is a real hell of a guy, who does not shy away from dangers. They call him Panama Joe, because he is tough, intelligent and cunning. 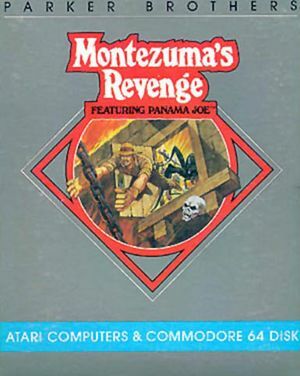 Your task is, to help Panama Joe cross a labyrinth inside a fortress, to find the fantastic treasure of Montezuma. On the way, Panama Joe has to avoid deadly creatures, while collecting preciosities and other items he will need later desparately. There are altogether 9 difficulty levels in the game. At the beginning you can choose from the first three. If a level is finished successfully, you get into the next level. Amulet: If Joe takes an amulet, he gains 100 points. When he does monsters become grey for a short time and can't harm him. Key: If Joe collects a key, he gains 50 points. Key can be cyan, blue or red. Doors: If Joe opens a door, he gains 300 points. He can open a door only using a key of the same colour. Jewel: If Joe collects a jewel, he gains 1000 points. Sword: If Joe collects a sword, he gains 50 points. With it, Joe can kill a spiders and skulls but not snakes. Torch: If Joe collects a torch, he gains 3000 points. With it, he lightens the dark rooms. Fire: Touching fire will kill Joe. Falls: Falling from a height too high will kill Joe, unless a monster intercepts his fall. Intermittent chains: Touching an intermittent chain will kill Joe. Skulls: Touching a skull will kill Joe and the skull. If Joe has a sword, he will kill the skull and gain 2000 points. Spiders: Touching a spider will kill Joe and the spider. If Joe has a sword, he will kill the spider and gain 3000 points. Snakes: Touching a snake will kill Joe and the snake. Single screens which are switched when crossing the border of the screen. The yellow hats below the items symbolise the number of lives left. At the right of the inventory the current level is shown. In the upper right corner the current score is displayed. The treasure chamber of level 1 (at the end of this level). You start the game with 6 Panama Joe's. There is an extra life every 10.000 points in level 1-3 (from level 4 every 20.000 points). Joe must not touch fire. Conveyor belts slow you or speed you up depending. Some pieces of the ground appear and disappear again. Precise timing is needed. There are red, blue and cyan keys that open doors of the same colour. If you lose all your lives without finishing a single level, press the fire button a couple of times at the game over screen and you'll get a new set of lives and are allowed to pick up where you left off, losing your score but keeping your items. This will not work anymore if you've finished at least one level. Magically your lives increase after a death. Werner: "Apart from the simple graphics and the meagre sound effects has this game a certain charme, that is missing in many games from today. 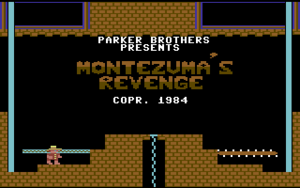 Due to the precise controls and the fair collision query is Montezuma's Revenge really lots of fun." Jodigi: "It was also one of my favourite Jump & Run games despite the tricky game factor. However, I found out rather late, that there are several versions, as the orignal machine version needed a bit more memory. The whole game as a 3D remake for the PC was a good idea, but somehow it cannot reach the game fun from the old times." Robotron2084: "Montezuma's Revenge is a successful platformer which plays very fluently and comes up with interesting features and a complex, nested level buildup. A firm difficulty grade requires attentive and concentrated play. But each situation can be mastered with the corresponding skill and planning and there are no unfair situations that tarnish the fun. Recommendable! 7 out of 10 points." 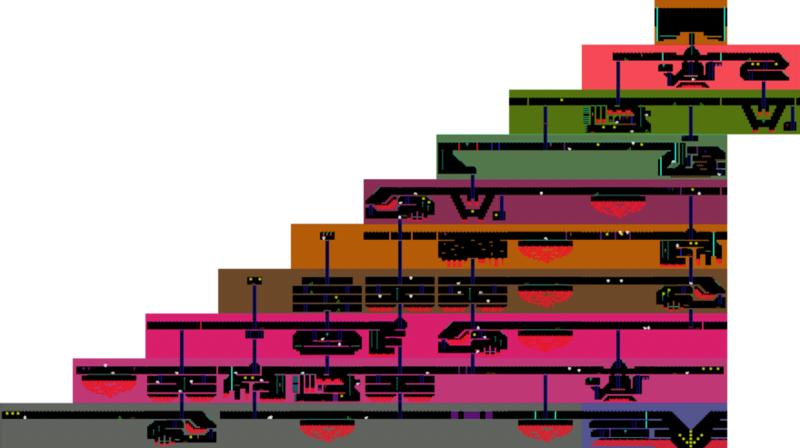 MtnBuffalo: "The large number of rooms and floors challenge the ability of the player to memorise which routes to use in order to clear the levels. Movement of Panama Joe is precise and smooth which gives a fast paced gameplay. When the 9th level is reached, everything is dark and no torches can be found to light up the level. The player must therefore know where ladders, robes and platforms are located in order to stay alive - awesome! Best C64 game ever!" This page was last modified on 27 May 2018, at 06:41. This page has been accessed 10,997 times.